Absatz is one of the stallions who had the biggest influence in changing the appearance the of the Hanoverians within the last 20-30 years to a more modern. elegant type. His son Argentan for example. standing since 1971, consistently produces the good Absatz type and presence, including three national champion mares in broodmare shows, and -among others- the impressive young stallion Airport. The Absatz sons Akzent I and especially Akzent II and his son Acapulco are also very good stallions in Germany. Overall, the line appears to be very versatile in sports ability, including success in hunter competition. Akatschi was imported in 2000 because of his superb stallion performance test results (10 on character and a 9 on temperament) and his show record under Hartwig Burfeind. For three years Akatschi was successfully trained and competed at Intermediaire I level in the U.S.A. by Todd Flettrich. He became Intermediaire 1 Reserve Champion ABIC/USDF Championships in 2000 and placed second at the 2003 Palm Beach Derby Series Kickoff. 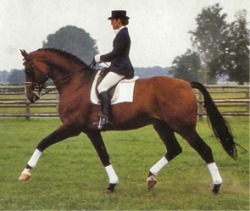 Akzent II was bred by Joachim Kemmer, father of German dressage team rider, Heike, and stood at the family stud, Amselhof, and then on lease at the Celle State stud in Altenbruch before coming to the Oldenburg stallion station of Ludwig Kathman in 1985. Akzent II was prized for carrying on the ‘type’ of the Trakehner Absatz: a noble head and appealing face, ideal neck and saddle position and a good shoulder, combined with a light-footed way of going. His dam was by the Thoroughbred, Waidmannsdank, who was one of the most influential Thoroughbreds of the post-war period in Hannover. 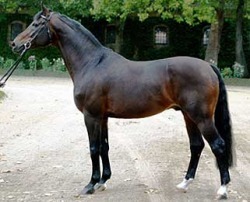 He was for many years the leading Thoroughbred sire of licensed stallions and head stud book mares, and second only to Der Löwe as a sire of competition horses. Not surprisingly, Akzent II scored very highly for type and rideability. In the Hanoverian Stallion Yearbook of 2002 (the last in which he appears) he is scored 144 for type putting him into the top ten category based on studbook inspections and 134 for rideability on the basis of the mare performance tests. His dressage score on the mare tests was only 112, still better than his jumping ranking of 101. His FN ranking was 116 for dressage and 100 for jumping. By 2002 he had produced 747 competition horses with winnings of DM1,183,852. His most successful competitor was Karin Schlüter’s Amazonas, the winner of the German Dressage Derby in 1987 with winnings of DM98,623, not far in front of Isabell Werth’s Agnelli FRH who won the Otto Lorke prize for Grand Prix horses under 10 years in 2000, and who by 2002 had won DM95,185. 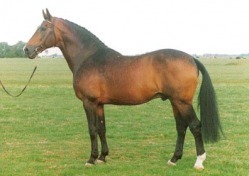 Akzent II was the sire of eleven licensed sons. 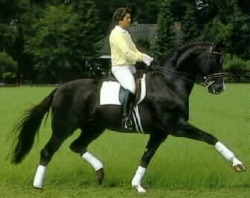 Brentano II was champion stallion at the stallion licensing in Verden 1985 and runner-up in the stallion performance test in 1986. He is by the famous sire Bolero, who was a foundation sire of very top class. Bolero always passed on to his progeny nobility, excellent movements and a high talent for dressage. Brentano II is probably his best siring son. Like his father, he is a very rideable dressage horse and highly esteemed as a hereditary transmitter of rideability and rhythmic motions. One of Brentano's successful dressage offspring is the mare Brentina (rider: Debbie McDonald, USA), who convincingly won the individual and team gold medals at the Panamerican Games in 1999, and who in 2001 achieved the highest grand prix score ever by an American horse. At the 2002 Olympics, McDonald and Brentina achieved two seconds and a third in individual events, and led the USA to team silver. Brentano II is also the sire of Bona Dea II, who was Champion mare 2000 at the famous Hanoverian broodmare show, the Ratje-Niebuhr-Show. 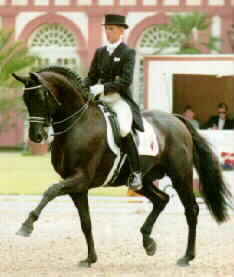 Brentano II was chosen Hanoverian Stallion of the Year 2003. Davignport has enjoyed a successful dressage career through Intermediaire. He won every Intermediaire class entered under Olympic rider, Bent Jensen. 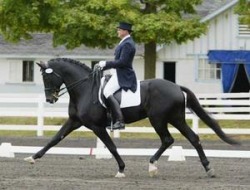 The USDF ranked Davignport 4th out of 127 stallions based on the success of his offspring in dressage. This ranking also included European stallions producing dressage horses in the U.S. This is especially impressive since Davignport's oldest offspring are only 6 years old! Foals by Davignport are exceptional. 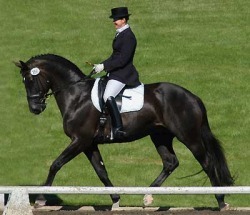 Many are undersaddle and already proven to be outstanding dressage horses as well as top hunter prospects. Donnerhall’s talent was apparent right from the start, and he scored 131.92 to be second in his performance test at Adelheidsdorf in 1984. Donnerhall’s competition career is the stuff of legend. He represented the highest combination of breeding and sports successes. His sports career was full of pinnacles:1986 honoured as DLG champion stallion, at the WEG at The Hague in 1994 with his lifelong rider Karin Rehbein he won team gold- and in free style the bronze medal. This result was repeated at the 1997 at the European Championships at Verden with Gold in the team and bronze in the individual. In 1998, Donnerhall and Karin Rehbein returned from the WEG at Rome with team gold and an outstanding fourth place in the individual results. Donnerhall won the World Cup European League, as well as being the Oldenburg dressage stallion of the year in 1997 and 1998 respectively. At the end of 1998 he was farewelled from competition, "fresh" at seventeen years of age, he "danced" to the tune of DM636.165 in competition winnings. He is considered one of Hannover's best jumper producers and had been listed as #2 living stallion in production of winning dressage and jumping show horses. Dynamo has sired 30 State Premium Mares and 12 Approved Stallions. Florestan I sports a sire line of world importance, that of Furioso II. He has produced many approved stallion sons and many state premium mares. Florestan I is recognized within the breed as a sire who can be relied upon for superior heritability. He produces outstanding basic paces, a beautiful head and lovely temperament. Florestan I has a superb dressage breeding index of 166 and his offspring include the successful young stallions Fleurop and Freudeprinz and the international dressage horses Floriano Deux, Florian Florette and Florian XII. He has had many top-priced auction foals. Freestyle is a beautiful stallion with an athletic body, very well applied hindquarters and a super character. At the 100 Performance test at Prussendorf he was awarded a 10 for 'character' and a 9 for temperament. In dressage he proved to rank amongst the best of his year and received a 9,33 for rideability. His total score was 132,55 pnt. Freestyle obtained the 7th place in jumping with an 8 for jumping ability. Freestyle himself is out of the famous mare line through Paloma. Paloma and her 4 sisters received the award of the "Best Family of Hessen" for 4 years on a row. Paloma produced two approved stallions, Freestyle and Flammengold, full brothers, and she received a score 8,1 for her mare-test. Her sister Patricia was in 1997 the best mare of Hessen. The second full-sister Pretoria was the best 3 year old mare of Hessen in 1998 and obtained a very high score of 8,50 for her mare-test. 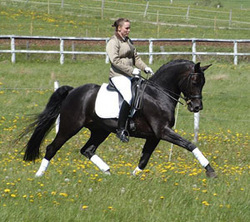 The other sister Primera was best mare of Hessen in 1999 and also received a score of 8,50 for her mare-test. The Youngst sister Primavera was 2nd at the mare show for two year olds at Asfeld. Grandmother, Geisha, is a full-sister of the dam of the world famous stallion Romadour II, the sire of Olympic Gold Medallist Rembrandt with Nicole Uphoff. The dam-line of Freestyle shows four state premium mares on a row, Paloma, Piroschka, Roxi and Geisha. 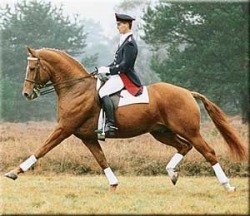 LORTZING, an imported, fully approved and licensed stallion by the German Hannoverian Verband, the American Hannoverian Society, the International Sporthorse Registry, and the Oldenburg Verband. He is a 16.3 hand German-bred black Hannoverian stallion, his bloodlines combine a proven heritage of the best dressage and jumping talent. LORTZING arrived in the United States after 6 years of outstanding service at the State Stud Farm in Celle, Germany. He passed the 100 day testing at Adel Heidsdorf in 1982 with an exceptional score of 129.0, and was 5th out of 39 horses tested. 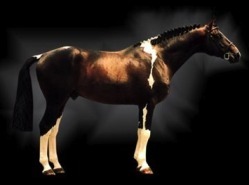 LORTZING holds the distinction of having been one of 6 horses on the German Black and White Quadrille, that traveled throughout Europe and Canada. In 1991, under rider/trainer Shelley Lawder, he qualified to go to the Pan-Am Game trials at the USET Headquarters, New Jersey, and won the team silver medal at the National Olympic festival at the Los Angeles Equestrian Center. Additional achievements include 1995 qualifier for the USDF Regional Dressage Championships at Grand Prix Open; 1995 USDF/AHS All Breeds Awards 4th place at Grand Prix; 1996 qualifier for the Olympic Trials, and a 1998 USDF Gold Medal. 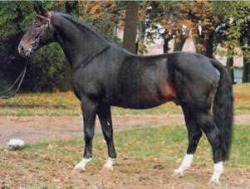 LORTZING's son Lowberg stands at the State Stud at Winstat, Dousa; his daughter Lorelei was the Champion Mare and Champion Hannoverian Mareat Devon in 1994; daughter La Boheme won first place Yearling Fillies at Osierlea Breeder's Futurity; daughter Lora was first in her class at the 1996 Glenwood Farms Hanoverian Inspection; son Ginzberg was exported to Canada and utilized in the Royal Canadian Mounted Police breeding program. During his performance test in 1975 Nimmerdor left no doubt as to his particular specialty; jumping. Preferent Nimmerdor was ridden at international level by Albert Voorn with whom he jumped in various world cups and made an impressive appearance at several important international competitions in for example Berlin, Paris, Gothenburg, Dortmund and London. Nimmerdor was invited to go to the Los Angeles Olympics but his owners declined as they considered it more important at the time that he devoted himself to his breeding activities. Nimmerdor is holding second place in the Dutch jumping index and breeds with a very high degree of heredity reliability [94%]. He is rated very highly in the WBFSH ranking. Nimmerdor is also approved for Holstein. Pikadero is an Elite Hanoverian stallion and Grand Prix jumper. 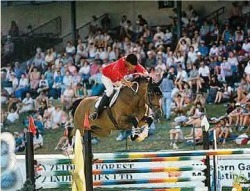 Competing with Hap Hansen in Grand Prix Jumping, Pikadero was a member of the United States Equestrian Team and represented the US at Hickstead, Champion Arnhem and Aachen. In his first three years of Grand Prix competition, Pikadero placed in more than 95% of all Grand Prixs started. Pikadero brings the desirable bloodline of Pik Bube to our breeding program. Rainbow* completed his 100 day stallion testing in germany. Under the watchful eyes of Burkhard Wahler, he finished with a final score of 121.74 points earning him a Klass I license. He placed 2nd out of 36 participants for Rideability and recieved an unheard of 9 for Character. In 1996 he received the Premium award, judged by the quality of his offspring, his competition record, and his scores in the jumper classes. He qualified and competed twice at the Bundeschampionat (German Federal Championships) and was shown with great success in High Preliminary Jumpers. Always in the top ribbons, he consistently gets 9's for style and technique. Rainbow* is the only Pinto stallion to have competed in the rigorous M levels of both Dressage and Jumping, with huge success. Rainbow* is the only German-Approved and 100-Day tested, Class I Licensed Warmblood Pinto available to sport horse breeders in the United States. He is also the only Pinto stallion to be honored as Elite before being imported into the United States. Rainbow* has been approved in Germany for eight breeding verbands. He is not a son of Samber, and thus can be bred back to Art Deco and Domino offspring. Rainbow's breeding includes the Thoroughbred, Dutch, and Trakehner lines, and is noted for all disciplines. He has three approved sons in Europe, and numerous offspring have been awarded Premium status. His temperament is superb, true to his sire, “his movement even better than Rubinstein” said Oldenburg Judge Evelin Vollsted during Rubignon’s licensing. An accomplished dressage performer, he had 40 wins at Grand Prix level, was a member of the 1996 Olympic team, sired 89 state premium mares and 66 approved stallions. He was the sire of many top auction horses and Grand Prix winners. 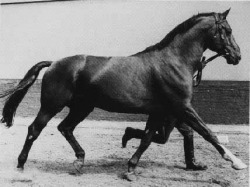 Rubenstein's dam, Antine, was a full sister to three-time Olympic competitor, Amon, and two-time Olympic champion, Ahlerich (rider: Reiner Klimke). Rubinstein's foals can be typified as being very correct and stylish with delicate faces, and an even better trot than their sire's. From his first foal crop, 16 colts received the premium of "stallion contender" and were awarded straight scores of IO. 0 points. They later lived up to the confidence of the inspectors by Rohdiamant's performance test win, wherein he scored 150.01 points. He also became Federal champion 5-year-old dressage horse, scored many dressage wins and was selected for the American Olympic team. Other sons of Rubinstein, Royal Diamond, Ratino H and Rubioso N continue to succeed in competition and the breeding shed. Noted Celle stallion, Rotspon, appears to be set to take up where his stellar sire left off. Rubinstein's offspring have set too many auction records to mention. 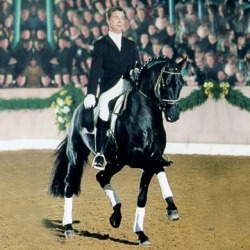 Former federal trainer of the German dressage elite, Johann Kinnemann, said of him, ". . when we consider a stallion of the century, we refer to Rubinstein." Sandro Hit has started a new dynasty in the world dressage scene and is rewriting sporting and breeding history. National Young Horse Champion, and Young Dressage World Champion, Sandro Hit, progeny are breaking all price-records, are regularly winning championships and Approval Championships. His offspring completely dominated the 2006 Oldenburg approvals. His success in breeding is no coincidence. His sire Sandro Song was Oldenburger Champion Young Stallion and Main Premium Champion. His dam, elite mare Loretta is as a dominant producer virtually unbeatable. She produced the Reserve World Champion and Reserve German Young Horse Champion Diamond Hit and the highly elegant 1c premium stallion Royal Hit. 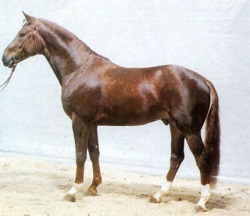 Her sire Ramino was Stallion Performance Test Champion and later on five times Italian Champion. Welt As from the third generation is one of the most influential producers over the last years, amongst others he sired Olympic gold medallist Bonfire ridden by Anky van Grunsven. 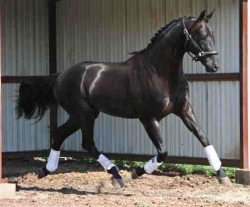 Sandro Hit, a strikingly beautiful black horse, brilliant type with quality movement, has a sheer black gene. The supporters of Hanoverian stud found him particularly interesting and once again he brought the highest price at every single foal auction in Verden. By the legendary sire Sandro Hit out of an Elite Donnerhall/Rubinstein I mare, Sonntagskind’s bloodlines speak well of his heritage and combine three of the world’s most famous bloodlines in dressage breeding. His accomplishments in the show ring and stallion approvals to date are a clear indication of his incredible athleticism and good temperament. Sonntagskind was the only stallion approved for breeding with the American Hanoverian Society in 2009 and was the highest-scoring stallion accepted into the ISR/Oldenburg N.A. breeding book with an incredible 229 points. Other achievements include: 2009 North American 30-Day Stallion Test Champion; 2009 70-Day Stallion Test, Reserve Champion; 2009 USDF Materiale Reserve Champion Four- and Five-Year-Old Stallion; 2009 Region 9 DSHB Champion Stallion and 2008 Region 9 DSHB Reserve Champion Stallion. He has consistently produced outstanding foals with elegant, modern builds – long legs, beautiful heads and nice, clean throatlatches – with movement suitable for the discerning dressage or hunter breeder. Sonntagkind’s foals are already making their mark at inspections and breed shows. In 2007, his first foal crop consisted of all fillies and Premiums foals; Heaven Sent was the North American Reserve Champion Filly on the BWP Keuring Tour. In 2008, filly Star Charmer earned Gold Premium status with the RPSI. We are looking forward to the arrival of Sonntagskind’s first Hanoverian and Oldenburg foals this spring. Watch for him in the show ring in 2010. A double helping of Quality under saddle: courageous jumping with exceptional calm disposition and beautiful unfolding movement in dressage. Brought on in show jumping to class M. He passes on his outstanding movement to his offspring. Imported to the US in 1995 Walldorf is by Watzmann who produced Walzerkonig, Olympic winner in Seoul. Walldorf was 1st out of 26 in his stallion testing. All three basic paces were given a grade above 9.0 -- Jumping was rated 8.0 -- Total score 149.26. 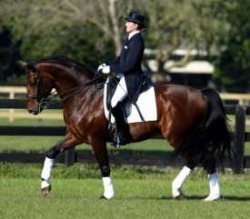 Walldorf is trained to intermediate level dressage. What more can be said about Weltmeyer? He is a legend. As the AHS put it, "Weltmeyer continues to almost single-handedly reshape the Hanoverian breed." He was the 1986 winner of the stallion licensing in Verden, and the 1987 winner of the stallion performance test in Adelheidsdorf. In the same year Weltmeyer also won the three-year-old stallions classification at the Federal Championships of German Riding Horses in Warendorf. In 1988 he was honored in Verden as best stallion of his age-group and awarded with the "Freiherr von Stenglin-Prize". One year later he became DLG Champion 1989 in Frankfurt. 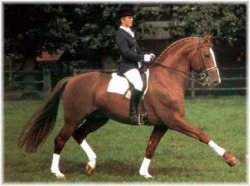 And last but not least he became "Hanoverian Stallion of the Year" in 1998. As of today, Weltmeyer has produced 70 licensed sons, all of them are excellent stallions. A study of the pedigrees of many internationally prominent Hanoverian dressage horses reveals that many are either by sons of Weltmeyer or out of one of his daughters. At the 2002 Ratje Niebuhr-Show, Weltmeyer was the leding sire. Out of 51 mares which placed first through third in 17 classes, Weltmeyer sired eight, including champion SPS Wiami and and reserve champion Wicke. Overall, his blood was present in one third of all the mares, by from 25% to 50% percent. When it comes to capacity for dressage and the temperament necessary for a top competitor, this stallion simply cannot be beaten. In 2005, Weltmeyer received a Breeding Value Index of 152 points, with an assurance of 99% heritability, from the German Equestrian Federation.